When a pool of water collects around the sink, its normal to start to feel frustrated and worried. Typically, it can be costly to call out a plumber but the good news is blocked drain are easy enough to unblock yourself. A normal house owner can usually unblock a drain in less than two hours. This obviously depends on how bad the blocked sink is. The article below will give you a couple of tips to unblock it yourself. 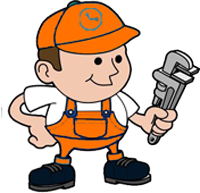 If there is a strainer over the blocked drain, you should remove any screws holding the strainer in place and then pry the strainer up with the tip of a standard screwdriver. If the strainer is loose, remove and wash away anything that has collected around the strainer and clean around the top of the drain. Stoppers should be cleaned on a regular basis since hair tends to twist around their base. Firstly, you should remove the sink stopper. Some stoppers can be removed by turning them with your fingers. Other stoppers require that you unscrew a pivot rod that is connected to the opener. This rod is be located under the base of the sink. If you need to use pliers to remove the stopper, make sure to pad them so you don’t chip the chrome finish. Once the stopper has been removed, clean it and wipe out the base of the drain opening.